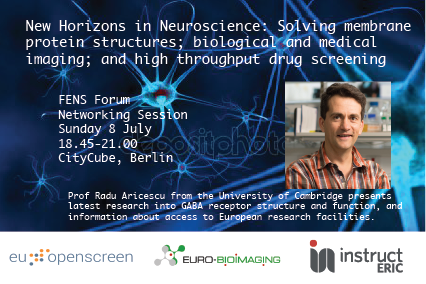 In July 2019, Instruct hosted a special networking session at the Federation of European Neuroscience Societies (FENS) Forum meeting. Prof Radu Ariescu from University of Cambridge gave a fascinating talk about Instruct services allowed him to solve the protein structure of a notoriously difficult yet scientifically significant membrane protein, the GABAA receptor complex. Naomi Gray followed with a short introduction to Instruct-ERIC, alongside introductions from our partner research infrastructures, EuroBioImaging and EU-Openscreen. The event drew an audience of 60 people, representing industry and researchers from many European countries. It was part of a project to widen access to Instruct-ERIC from researchers from other life science disciplines. Whereas Instruct-ERIC is well received among structural biologists, it is less well known among neuroscientists, where structural biology techniques have huge potential to be exploited.